I was dreaming this recipe up for ages. I was stoked when Northern Rivers Dreaming gave me some of their homegrown ginger. I knew I wanted to use some of it this butter cream. It took me a little longer to realise I should make the crystalised ginger too. 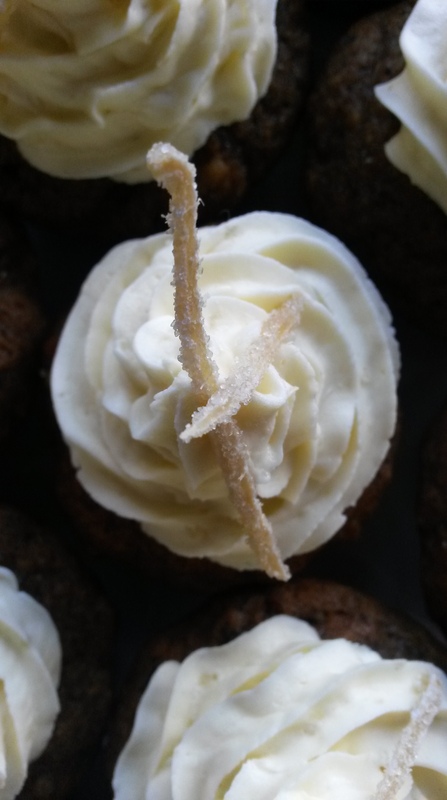 You could use the bought stuff, but I love how these cupcakes look topped with matchsticks of crystalised ginger. You’d probably need to have diamonds of store bought ginger. Never mind though. This recipe makes light and fluffy date cakes gently spiced with cinnamon and cloves. The buttercream frosting is flavoured with fresh ginger paste. ** Peel and slice fresh ginger and pound it into a paste in a mortar and pestle. Place the dates and water in a small saucepan. Bring to the boil and simmer for five minutes. Sprinkle with bicarbonate soda, allow to fizz and cool. Blend the mixture into a fine paste (or mash as smooth as you can). Allow to cool completely. Cream the butter and sugar till light and fluffy. Add the cinnamon and cloves. Beat in the eggs, one at a time. Add the cool date mixture and fold through the flour. Grease a mini muffin pan thoroughly. Fill the cups halfway up and bake for 15 minutes or until the cakes spring back up when you touch them. Remove the cupcakes from the pan and allow to cool completely on a wire rack. To make the frosting, beat the butter and gradually add the icing sugar. Add the ginger paste and beat till pale and fluffy. Scoop the frosting into a piping bag fitter with a star shaped nozzle. Pipe the frosting onto each cupcake in a spiral starting at the outside and working inwards. 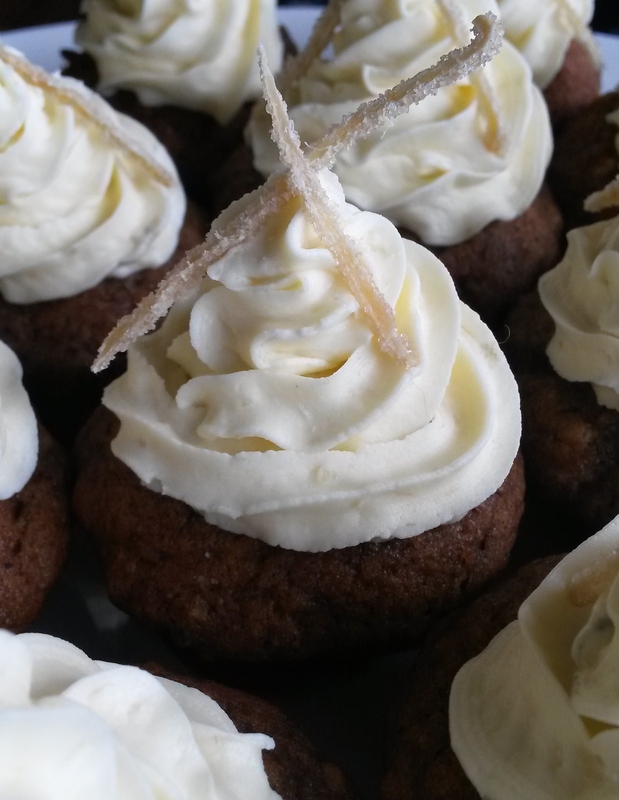 Top each cupcake with some crystalised ginger.